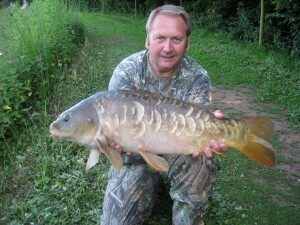 We pride ourselves in the way we present our Fish at Denbury Farm for those on a Carp Fishing Holiday. It makes us believe we offer one of, if not the best venues for Carp Fishing in the UK. In Little Grebe our largest Water of an acre in size there are Ghost, Common and Mirror Carp in a mixed Lake. 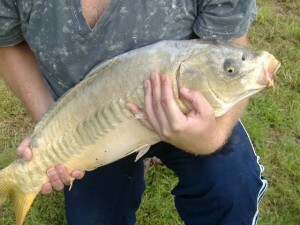 Pristine Carp of 33lb +. The likes you have never seen, let alone caught. Many of our guests tell us that pound for pound the Fish at Denbury Farm are the best fighting Fish they have ever experienced. Our Lakes are not over Fished so don’t expect our Fish to jump on your hook. Your will be able to use all of your experience, fishing skill and knowledge to catch our beautiful Fish on Carp Fishing Holidays. Whilst Fishing for Carp On Little Grebe Water you can float fish with one of your rods for our beautiful Roach and Rudd to 3lb +, Crucian Carp to 4lb +. You may also fish the odd Green Tench. Again all pristine Fish, that many tell are the best they have ever caught. Denbury Farm is not all about Fishing, It is a great place for a family holiday. Centrally located to explore the Southwest. If you prefer to stay on the Farm there are 85 acres of meadows and woods to explore and experience our wonderful diverse wildlife. For those who enjoy walks or to find a place for a quiet chill out. We encourage children and their parents to help with any orphan lambs that we may have. Our free range chickens, turkeys, ducks, horses and friendly sheep are a delight for the whole family. Our exotic animals are educational and lots of fun. 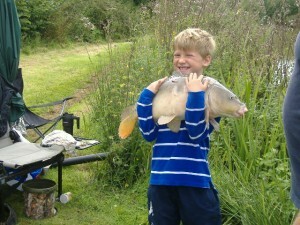 Great Fishing, Great Venue, Great Fun and a Great Holiday.